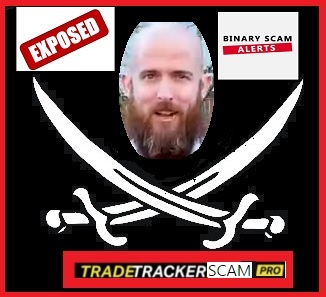 Binary Scam Alerts is issuing a severe SCAM warning in regards to Trade Tracker Pro (AKA the Trade Tracker Software and App) managed by Derek Stone and Josh. After being bombarded with a salvo of particularly disturbing complaints about a bearded scam artist trying to promote a fake binary options app, our staff of determined researchers conducted a full investigation and produced a detailed review which exposes this cheating scheme. Trade Tracker Pro has been caught red handed trying to deceive, victimize, and mislead innocent day traders. The images below tell the story, and you don’t have to be a genius to understand that these pirates are using actors to promote their trashy trading app. This guy Derek Stone even resembles Blackbeard, only his methods have been perfected, and now he wants to show you he is cashing out money from an ATM machine just so you believe his imaginary story about making millions trading binary options online. As you can see in the screenshot “Josh” is actually one of the actors in one of the all time most dangerous and deceptive scams ever concocted by affiliate marketers, the Free Money System and Walter Green AKA “The Green Machine”. Only in the other one he is called “Anthony Pitts” if you believe that. These actors are ghosts with no social or public profiles on Facebook or LinkedIn, Josh doesn’t even have a last name and the bearded scammer is probably some bum they picked up from the street who would sell his kidney for a bottle of cheap rum. The actual software is a rehashed piece of garbage used by the Tauribot App, which is in my opinion one of the nastiest and cheating schemes available today online. These guys are actually exposed to a potential Trade Mark Infringement Lawsuit by Chicago University and can be held liable in a court of law. If the same people are behind this thing, the last thing that should concern you is your ITM ratio and fancy charting tools in the form of candlestick analysis and various market trends. It won’t matter if you trade 60 Seconds, Ladder, or High/Low, you are pretty much cooked and stuffed like a Thanksgiving Turkey if you bought into this, and you need only concern yourself with how to get your money back and avoid getting over-charged on your credit card. After you fund your account the software intentionally takes inferior positions and eliminates any chance you have of actually profiting. The con is extremely effective because it promises the opposite, I mean who wouldn’t like to make “$80,000 a month” from the comfort of their own home. In reality this is just another get-rich-quick scheme with the standard sales pitch designed for anyone who is willing to jump on the bandwagon. Well yes, but you need at least $250 to fund a broker account to try out this useless piece of trash. These would include but are not restricted to: The Amissio Formula, Copy Buffet Filthy App, Trade Fusion, Citidel LTD, Push Money App, Insured Profits with Dave and Ginny, Millionaires Blueprint, and Centument. If you are looking for the real deal in the form of signals you will definitely want to check out our Binary Profit Method Review. For a solid Auto-trader please read about Virtnext. As you may well have guessed the Trade Tracker Pro Software and APP as well as Derek Stone and Josh is a dirty scam designed to steal your money. If you are deliberating and not really sure if this system is genuine or bogus, you can now make an informed decision based on factual evidence. There is nothing legit, sincere, or honest about this software, and the staff and management of Binary Scam Alerts recommends you keep your distance and avoid it like the plague. As always, if you have invested in this thing please contact us and we shall try our utmost to assist you in retrieving your lost funds. Don’t forget to join our Facebook page and Subscribe to our YouTube Channel.